This past weekend I had the privilege of spending time with the Wiltwyck Quilters Guild in Kingston, New York. I want to thank everyone in the guild for making us feel so welcome, especially Susan, who contacted me over a year ago and invited me to do a Trunk Show and to teach a couple of workshops for their guild. Colleen (from Elite Quilting) came with me to share in the 7 hour drive. Lucky me, Colleen did all of the driving. There and back! 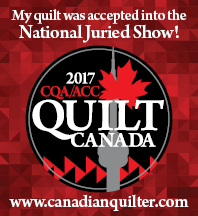 Here I am talking about my quilts (one of my favourite things to do!). They loved my accent. I loved theirs. It was all good! First we started with the flag. You can see that the red stripes are prepped and then glued on to the full size white piece. Notice the bottom of the blue section is tucked underneath the stripe. Once all the stripes are stitched in place, the outer white section can be trimmed away from the top and bottom. By the way, this technique is called “off-block construction”. Because it is constructed off the block! So you can see I trimmed the outer section of the white away and now this entire piece can be glued on the background. Next the leaves are added. Then the flagpole, the stem and berries (in that order). Next we added the feet (tricky, yes , but you can do it!) and the legs. Now you can add the wings and the body. Once you get this far you will want to give yourself a pat on the back!! You can prep this stem/leaf section in one piece if you are brave. Or you can cut it up into a stem and leaves like I showed you. Your choice! You can add the ribbon, and the leaves and stem. Then add the pretty pink and purple flowers. At this point you can add the eagle’s head and skinny stems. And now you are able to add the second part of the ribbon. Notice that the ribbon goes under one section of the beak and over the other section of the beak. Tricky! So now you can just add the rest of the leaves and stems and rosebud. I used a pale yellow for the star and oval section of the flagpole, even though I thought it might be a bit drab. I was right. Drab. So I unstitched it and used a bolder yellow. Never be afraid to switch out a part of the block if it doesn’t turn your crank! And here is the (almost!) finished block. I just need to do a bit of embroidery and give the eagle an eye. We were lucky enough to have access to a sink during the workshop, so I showed the class how I wash a block. In my next post, I will show pictures from The Braided Flower Basket class. Everytime I receive an update on your work it’s make my day. Hi Jocelyn! Hope all is well with you. Doing much stitching these days? It was so great to have you. I haven’t done any more on the eagle, but I’ve made great progress on the basket. Your techniques are a game-changer for me. Both you and Coleen were a delight to have and to learn from. Glad you could come to our area. Hi Kerry, almost there, still 2 borders, corner pieces and 2 blocks to go! I delay the wash, the most scaring thing, but I have to! Your stories about your Baltimore Friends were very helpful. Thank you again! Thankyou for the tip about stitching off the block, it makes so much sense! I was interested when you talked about washing your blocks. I would not have thought of that, but having just finished the Mimi’s bloomers quilt, I realise it would have been easier than washing the whole quilt! As always, your process photos make it look so easy. I’m working on a permanent space in my sewing room just for applique. Hoping that will spur me to get back to it. Great way to save time on the flag. Beautiful work! The best applique classes I’ve ever taken! The blue fabric used for the eagle is so vibrant. A perfect choice.